I have a meeting with a lady. She is, apparently, very beautiful. 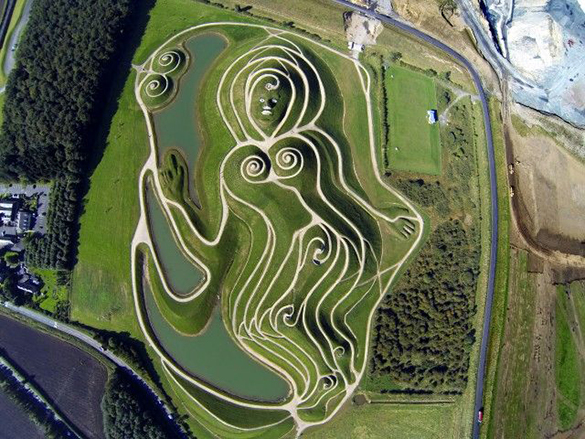 She is called Northumberlandia. Although we have not met before, I know I am about to become one more admirer. I drive a long way to our rendez-vous in Northumberland, England. The weather gods have served up the vilest of British weather for our first encounter. I emerge from a dripping beech forest and catch my first awe-inspiring side-view of her face and breasts. She takes no notice of the lashing wind and rain. The full extent of her beauty is revealed when, later, I go on-line and find an aerial view taken in unimaginable sunshine. Northumberlandia, seen from above or explored at ground level, has the air of some ancient pagan queen. She is immense. She exudes fertility. Her coy pose and raised right index finger indicate that she is at once inviting and admonishing. Her vital statistics are impressive. She is four years old. She is 400 metres frown crown to toe. Her nose is 40 metres above the ground. She weighs 1.5 million tonnes. Her features are drawn by six kilometres of sandstone paths. She is beautiful stuff on a grand scale. I am smitten. This is one more dazzling project conceived by architect-sculptor Charles Jencks who took inspiration from the feminine forms of the distant Cheviot hills. Today, these hills are lost to view. Big public sculpture doesn’t get better than this. The whole enterprise was sponsored by the BANKS Group. They run the adjacent Shotton surface coal mine from which the rock and clay for the construction were transported. DEFRA provided additional funds. The land was donated by the Blagdon Estate. The site is co-managed by the Land Trust and the Northumberland Wildlife Trust. It warms my heart that such co-operation is possible in the spirit of creativity and environmentally conscious development. I stand atop her right breast. I can’t help thinking that the undulating green of her right hand could have been the work of Old Tom Morris. I am alone. The wind blows harder. I struggle unsuccessfully to keep my camera dry. I decide to take cover in the visitor centre. I meet Wayne, Northumberlandia’s warden. Today, he has time to chat. Nice guy. He makes me a warming cup of coffee. He is justifiably proud of his charge. When the weather is fine, he tells me, the place is heaving. Last year saw 90,000 visitors. I buy a post card, say goodbye and trudge soddenly back to my car. I am cold, wet, enthralled and enchanted. 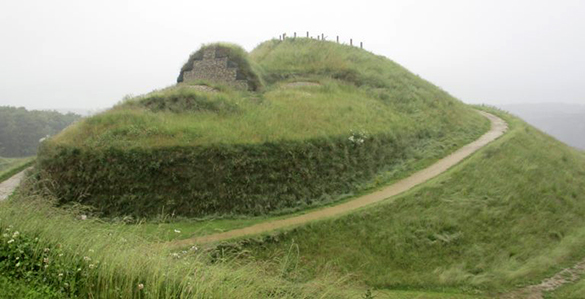 I am determined to see Northumberlandia again.